We wandered through the crowded Del Ray farmer’s market, ogling the fresh produce making its way from farm to market. CRR paused at the beets. I suggested we wait. Just in case. We purchased a few vegetables, then headed over to our own garden. Sure enough, a week of rain and warm temperatures had given our garden a growth spurt that yielded the first beets. 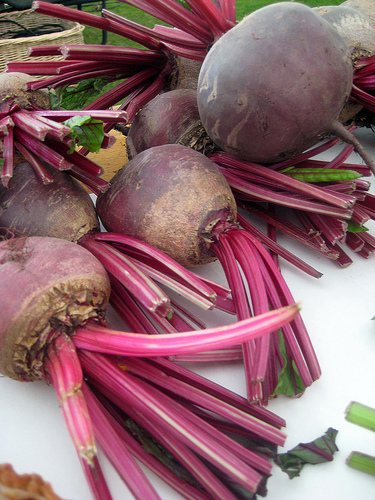 Taunus, a cylindrical hybrid that grows 6 to 7 inches long, has become our go-to red beet. It is fast-growing (65 days) and sturdy enough to stand up to Washington’s withering heat, so we typically do several plantings as garden space allows. We ripped out the remnants of the lettuce crop and planted more beet seed—gold and red. Then we triumphantly harvested the first half-dozen beets of the season. I cut off the beet greens, which CRR likes to sauté with a dash of vinegar. I prefer the beetroot, which over the summer we will fashion into myriad dishes: slow roasted in the oven…sliced and layered with goat cheese and herbs … borscht, hot or cold…grated with carrots into a jewel-like slaw created by our friends Ruth and Tim. I never tire of beets, so send me your favorite recipes. But for the first beets, a simple preparation is best. I simmered them until tender, slipped off the skins, then sliced them into 1/4 –inch rounds and spritzed them with a little margarine. Sprinkle with salt and pepper. Yum. I shouldn’t say this, but beets are more sacred to me than taro roots, their pale Hawaiian sisters who live to be pounded into pale purple poi and who Hawaiians believe to be literal descendants of their ancestor. Well-washed early beets from my mothers Utah garden ideally are chopped with their skins into irregular half-inch-thick pieces, along with the pink stalks and deep green leaves, simmered in a little vinegary water with a squirt of lemon and a pat of salted butter (sorry, no margaine,) and a couple of twists of pepper (sorry, no margarine). But I like the roasting and layering multiuse concept for more-mature beets, and Mother’s big-slice pickled beets help carry them all the way to the Thanksgiving table. Hands down, roasted beets in salad is my favorite. I often just grate them up for raw salads, combined with carrots, raisins, apples, and a light yogurt dressing. So pretty!